According to the 1962 Missal of St. John XXIII the Extraordinary Form of the Roman Rite, today is the feast of St. Thomas of Villanova, a great saint of the Spanish Renaissance and a good friend of Emperor Charles V. He was a man of infinite charity in word and deed and lived as frugally as the poor who benefited by his unstinted almsgiving. While provincial of his order in Castile, he sent the first group of Augustinians to the Americas. Establishing themselves in Mexico, they were integral in the growth of Christianity in the New World. This date is also the commemoration of Sts. Maurice and Companions, Christian soldiers who were massacred in Switzerland because they refused to offer sacrifices to pagan gods. They are also called the Theban Legion. St. Thomas was born in Spain in 1488, and inherited a special love toward the poor from his parents; he often gave away his very clothes. After the death of his father and mother, he used his inheritance to sustain poor virgins. 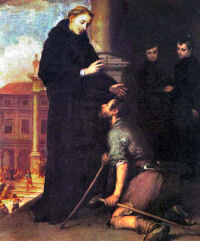 He became a lecturer in the higher schools at Alcala, entered the order of the Hermits of St. Augustine in 1516 at Villanova, and acted as court preacher to Charles V. Against his will he was made archbishop of Valencia (1544), then exercised the office as a zealous shepherd of souls and a great friend of the poor. The bed in which he died was borrowed back from the one to whom he had given it as alms shortly before. During the sixteenth century he was called the "apostle of the Spaniards." Symbols: open purse; wallet; bishop's mitre; book; bag of coins. St. Maurice was an officer in the Theban Legion, a unit in the army of the Emperor Maximian Herculius. This Legion, from Upper Egypt, was entirely Christian, and when Maximian ordered his soldiers at Octodurum (now called Martigny, Switzerland) to sacrifice to the gods as a way of ensuring victory in battle, Maurice and two other officers led the Theban Legion in refusing, and thelegion with drew to Agaunum (now St.-Maurice, in the Swiss Canton of Valais). With Maurice encouraging the legionnaires to remain constant, even after the Emperor had the legion decimated (every tenth man killed), the legionnaires answered, "We have arms in our hands, but we do not resist because we would rather die innocent than live by any sin." Maximian ordered the rest of his army to kill the Christian legionnaires. The Theban legion numbered about 6,600 men, but the actual number killed remains unclear. Others were martyred for refusing to share in the spoils of the legionnaires. St. Eucherius, a fifth-century bishop of Lyons, noted that many miracles took place at the shrine of these martyrs. They are buried under the Basilica of St.-Maurice-en-Valais in Switzerland. Patron: Against gout; against cramping; against arthritis; Alpine troops; armies; Austria; clothmakers; dyers; infantrymen; Piedmont, Italy; Sardinia; soldiers; swordsmiths; weavers. Often Portrayed As: soldier; soldier being executed with other soldiers; knight (sometimes a Moor) in full armour, bearing a standard and a palm; knight in armour with a red cross on his breast, which is the badge of the Sardinian Order of Saint Maurice. Read the Golden Legend story of St. Maurice. The Theban legion numbered more than six thousand men. They marched from the East into Gaul, and proved their loyalty at once to their Emperor and to their God. They were encamped near the Lake of Geneva, under the Emperor Maximian, when they got orders to turn their swords against the Christian population, and refused to obey. In his fury Maximian ordered them to be decimated. The order was executed once and again, but they endured this without a murmur or an effort to defend themselves. St. Maurice, the chief captain in this legion of martyrs, encouraged the rest to persevere and follow their comrades to heaven. "Know, O Emperor," he said, "that we are your soldiers, but we are servants also of the true God. In all things lawful we will most readily obey, but we cannot stain our hands in this innocent blood. We have seen our comrades slain, and we rejoice at their honor. We have arms, but we resist not, for we had rather die without shame than live by sin." As the massacre began, these generous soldiers flung down their arms, offered their necks to the sword, and suffered themselves to be butchered in silence.